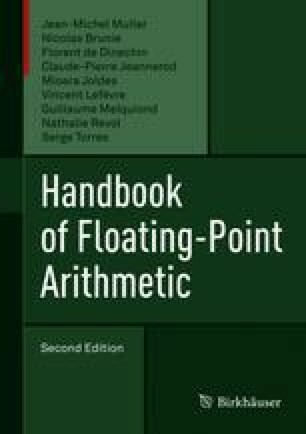 The previous chapter has presented the basic paradigms used for implementing floating-point arithmetic in hardware. However, some processors may not have such dedicated hardware, mainly for cost reasons. When it is necessary to handle floating-point numbers on such processors, one solution is to implement floating-point arithmetic in software. J. R. Hauser. The SoftFloat and TestFloat Packages. Available at http://www.jhauser.us/arithmetic/. C.-P. Jeannerod and G. Revy. FLIP 1.0: a fast floating-point library for integer processors. http://flip.gforge.inria.fr/, February 2009. C. Q. Lauter. Arrondi Correct de Fonctions Mathématiques. Ph.D. thesis, École Normale Supérieure de Lyon, Lyon, France, October 2008. In French, available at http://www.ens-lyon.fr/LIP/Pub/Rapports/PhD/PhD2008/PhD2008-07.pdf. S.-K. Raina. FLIP: a Floating-point Library for Integer Processors. Ph.D. thesis, École Normale Supérieure de Lyon, September 2006. Available at http://www.ens-lyon.fr/LIP/Pub/PhD2006.php.